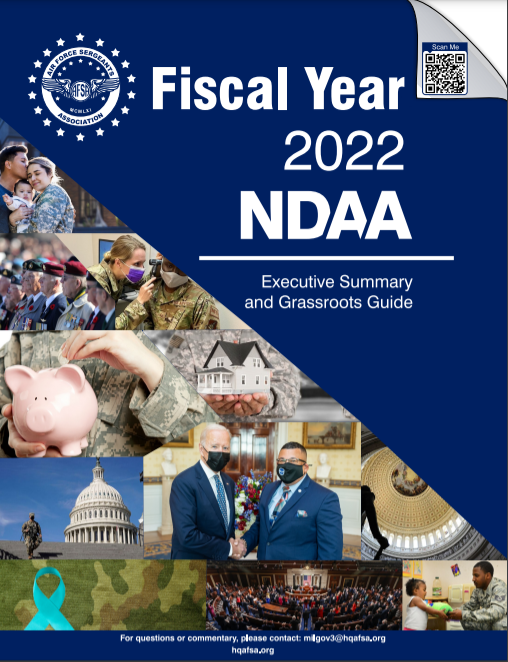 Your AFSA leadership advocates, educates and legislates in Congress and with military and local leaders to keep you protected and up-to-date on issues, laws and regulations that strongly affect your earned benefits, services and family support. We are grateful for the many Mission Partnerships, if you own a business that supports military members and their families, we'd love to connect and share our wide range of sponsorship opportunities. For additional information contact our afsacomm@hqafsa.org now. UNIFORMED: All Active Duty, Guard, Retired and Veteran Military Members: Joint Services Enlisted and Commissioned Officers. ASSOCIATE: DoD Civilians, Civil Air Patrol, JROTC, Member Service Providers/Sponsors, Non-Military Supporters. Give the Gift of Membership - share the benefits with Airmen, friends, family and co-workers. Join, renew or to share a gift membership now. 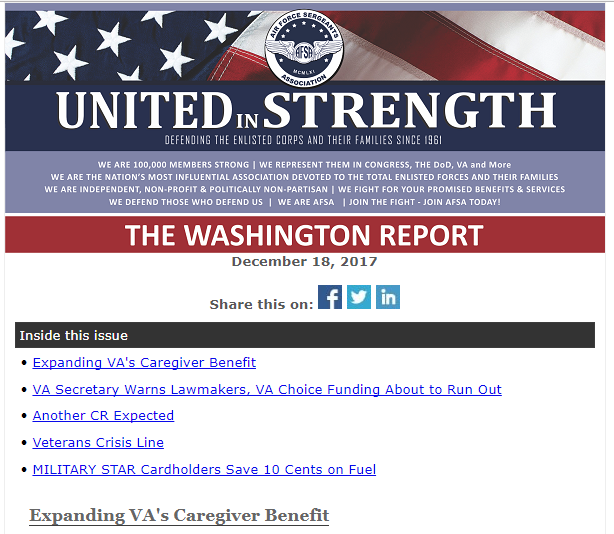 ​Our legislative priorities are specifically focused on issues that affect the enlisted corps and their families. The AFSA Military & Government Relations representative regularly meets with members of the United States Congress and United States Air Force senior leaders to advocate for fair and equitable benefits that matter to today’s Airmen and their families, and to veterans. 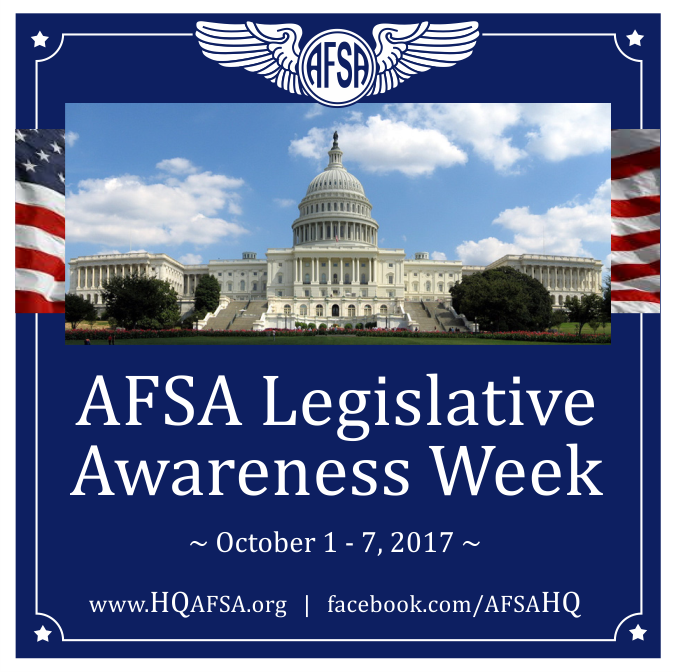 View the complete AFSA Legislative Platform here. ​Get connected now... communication, an informed and active membership, and legislative committee are key to the success of our organization. 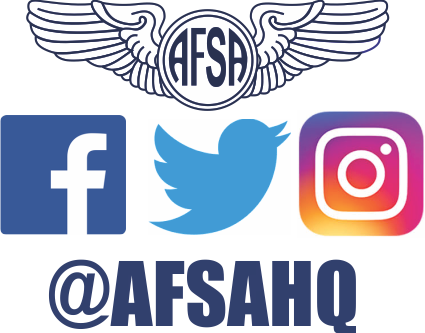 AFSA fulfills these critical functions by distributing information through the AFSA website and social media outlets, the AFSA Magazine, legislative bulletins, newsletters and other important and timely publications. Your first stop for AFSA membership and mission information is the AFSA website. Visit About Us for our history, objectives, leadership, division and chapter locations. Select the Member Log-In tab to update your information, access the AFSA Chevron Store and more. We’re very social and you’re invited to join in to comment and share our posts and special membership information. 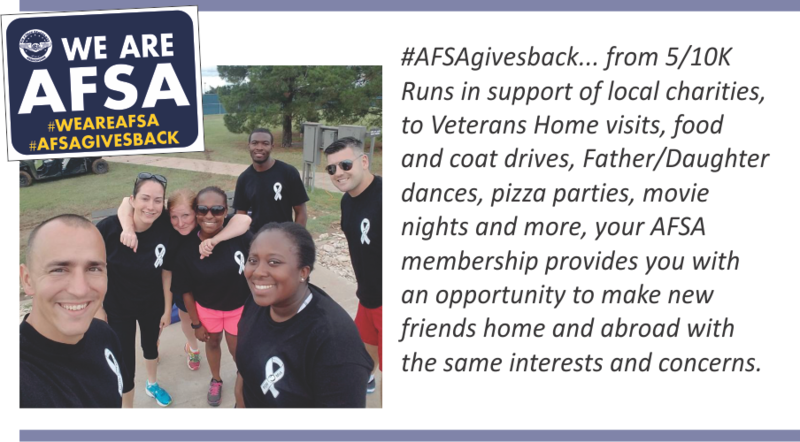 AFSA Magazine is AFSA’s premiere publication and is used to inform members, congressional representatives, Department of Defense and Veterans Administration officials, and the public about issues, topics, events and actions affecting the Total Air Force enlisted members and their families. Published quarterly, the AFSA Magazine is available as an online publication and is sent directly to members via email. 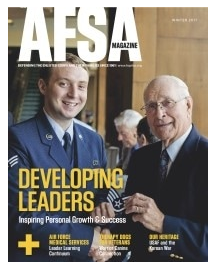 To view current and past issues of the AFSA Magazine click here. AFSA’s Legislative Action Center is a hub of information about all things legislative. 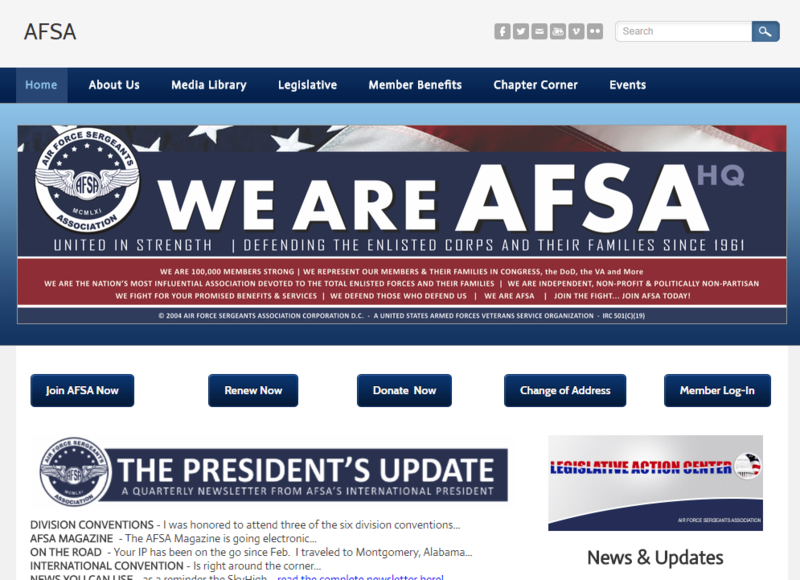 On this site, members can search for and communicate with their elected officials, sign up for action alerts, search for legislation by key word, and take part in the latest AFSA advocacy or survey campaigns. Interested in becoming an AFJROTC Instructor? Employment opportunities for recently retired or retiring Air Force members. You can also go ﻿﻿here﻿﻿ for complete instructor requirements and application information. The AFSA Conventions and Professional Airmen's Conferences feature general sessions, professional development forums, formal banquets, the Convention InfoExpo, and the AFSA M.A.S.S.C (Marines, Airmen, Soldiers, Sailors and Coasties) Transitioning Workshop and Hiring Event. AFSA and the Airmen Memorial Foundation (AMF) joined together to conduct a scholarship program to financially assist the undergraduate studies of eligible dependent children of the enlisted Total Air Force members. AFSA, AMF (including the CMSAF Scholarship Program), and AFSA International Auxiliary award scholarship valued from $500 to $3,000 to students attending an accredited academic institution. The grant amount and total number of scholarships awarded are dependent upon funds available. To date, over 2 million dollars in scholarships have been awarded to Air Force dependent children of AFSA members. Educational Support & Scholarships: Applications for the upcoming academic year are available between January 1 and March 31. Completed application packages with all required documents can be sent to AFSA Headquarters NLT March 31. After March 31, applications are ineligible for consideration. A Preferred AFSA Mission Learning Partner, and one of the Nation's top online universities, CSU offers AFSA members a 10% tuition discount and will waive the application fee ($25 value) through the learning partnership. Employees, along with their spouse and children, can learn more about these benefits by visiting the CSU partner webpage. The eKnowledge SAT/ACT Prep Project with AFSA enters its 13th year assisting students and families. A value of $350 waived. Students pay only $14.99 for the cost of streaming, student support, customer support, shipping, and materials. To order the free software, click here. To order by telephone, call (951) 256-4076 and reference AFSA. There is a nominal charge of $14.99 for the cost of materials, processing, distribution and customer service. FELA, Financial Education & Literacy Advisers (FELA) offers a complimentary, online financial education program known as LifeCents for VALOR for AFSA members and their families. Signing up is quick and easy, and you have the opportunity to win gift cards, books, and more. AFSA members can sign-up for LifeCents for VALOR by clicking here. To learn more about VALOR, visit www.valorusa.org or send an email to info@valorusa.org. A WASC accredited, 100% online university, offers AFSA members and their families a 15% discount for bachelor's degrees, 27.5% for master's/MBA degrees under military TA program and will waive the application fee ($75 value) and no cost for textbooks. A Preferred AFSA Mission Learning Partner of AFSA. Provides AFSA members and their families with a 10% discount on your Waldorf online degree tuition. In addition, you, your spouse and children, qualify for a $500, one-time scholarship towards first-year tuition costs. To learn more about your benefits, please visit our learning partners page on the ﻿Waldorf website﻿ or call 877-267-2157 to speak with an ﻿﻿admissions representative today. The AFSA International Convention is held annually and is host to the Professional Airmen’s Conference. Members and guests learn about issues affecting the U.S. Air Force and our national security. The Conferences feature educational forums, key note speakers and participants from senior congressional, DoD and Air Force military leaders, educational centers, supporting joint services trainers, as well as Enlisted Leadership groups. These forums continue to build on the strong, solid foundation of activism, education and support for our Total Enlisted Corps and their families. The 7 AFSA Divisions and 127 Chapters hold annual conferences at local levels to provide a wide range of educational, mentoring and professional development opportunities, community support, award and recognition ceremonies. The Annual Conferences and Convention are a great way to meet, greet, network and celebrate with your peers. Start monitoring and protecting your identity. InfoArmor uncovers identity fraud at the source to detect more fraud sooner, including unauthorized account access, fund transfers, and password resets. Receive a free instant quote or enroll online. Learn more here. Enroll here. Health, Life, Dental, Cancer, Long-term Care, Travel, and Pet Insurance. An AFSA Mission Partner, Mercer offers a variety of insurance options to fit you and your families' needs. Your AFSA membership entitles you to a FREE $1,000 Accidental Death and Dismemberment Insurance Certificate. ​Click here now and select the “Resources” tab to download a copy of the insurance certificate. Prepaid legal services plan that includes access to your credit report (or consumer credit disclosure), consultations, expert restoration and more. No matter how traumatic. No matter how trivial. Whatever your situation, we are here to help. We help Veterans buy cars. A veteran-owned and operated company dedicated to providing AFSA members and their families with a respectful and superior automobile purchase and ownership experience. A team of highly seasoned real estate professionals dedicated to providing AFSA members and their families with exceptional, personalized service throughout the entire buying and selling process. Upon request, will provide a free consultation and a dedicated realtor in each state. AFSA members and their families will save an average of 20% on prescription drugs not covered by insurance and as much as 50% on select generic medication when ordering by mail. To print your prescription card, click here,click on “Quick Links”, then select “Prescription Discount Card”. AFSA members and their families can earn lots of cash back for shopping at your favorite stores such as Kohl's, Target, Nordstrom, Zappos, Sephora, and more. Shop and earn cash today! Click here now! AFSA members and their families can save on select Dell products. Subscribe to the Air Force Times for only $39.95 for 52 issues. With this exclusive offer, you’ll save 76% off the newsstand price. Air Force Times will also donate $5 to AFSA for every paid subscription. To subscribe, click here or call 800-368-5718. AFSA members and their families may receive savings that exceed 50% and average 10-20% below-market on all hotels around the world. AFSA members and their families may receive discounts from Enterprise/National and Hertz. In most cases, rates are lower than those available with a government ID card. eMentor is a cutting-edge online mentoring program for military personnel, veterans and military spouses. eMentor connects individuals for dynamic mentoring experiences that powerfully move them forward in their personal and professional lives.